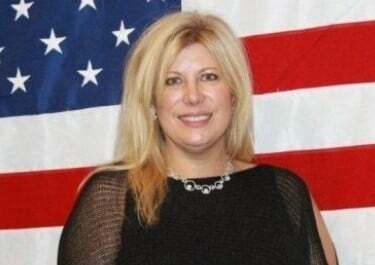 April Kauffman, 47, of Linwood was found fatally shot in her bedroom Thursday, May 10, prosecutors said. LINWOOD — Neighbors were shocked Thursday to learn of the fatal shooting of April Kauffman, a local radio talk show host, businesswoman and community volunteer found dead in her Linwood home. Police discovered the body of Kauffman, 47, at about 11:30 a.m. Thursday after a 911 call from a worker who had found her shot in her bedroom, Atlantic County Prosecutor Ted Housel said in a release. No arrests have yet been made in the shooting, Housel said. Kauffman hosted until February a weekly radio talk show on AM radio station WOND-1400, where she advocated for numerous causes, particularly the Atlantic County Toys for Kids Program and various veterans issues. She held a Thanksgiving dinner each year for about 50 recruits from the Cape May U.S. Coast Guard Training Center in her Linwood home, said Bill Butler, commander of American Legion Post 352 in Somers Point. Last year, Kauffman was one of the key organizers of a petition to allow veterans to use Shore Medical Center for health care instead of traveling to a Department of Veterans Affairs hospital in Wilmington, Del. She had also received the governor’s Jefferson Award just a few days before her death. The award is given for outstanding community service. Kauffman owned and operated two Northfield businesses: Cherry Caterers and Artistic Salon. Her husband, James Kauffman, is a practicing endocrinologist in Linwood. Records from 2011 list James Kauffman as the owner of the home. It is unknown how many people lived in the large home at the end of the cul-de-sac. Donna Clementoni, of Egg Harbor Township, said her last communication with Kauffman was an email that Kauffman sent her around 1:50 a.m. on Thursday regarding an event the two were planning. Clementoni called Kauffman sometime around 9 a.m. — as she did every day — but never heard back. Later in the later, she learned of Kauffman’s death from other friends. “I have no idea why anyone would do this. She’s like a local legend. She’s outspoken. She’s like a bombshell and all she ever wanted to do was help people,” Clementoni said. The Atlantic County Prosecutor’s Office Major Crimes Unit and units of the Linwood and Northfield police departments were on scene as officers blocked the only entrance to the cul-de-sac at Wabash Avenue, about 100 yards from Kauffman’s home. Several neighbors, who did not want to give their names, expressed shock at the news. Meanwhile, several passersby — who continued to walk their dogs or jog along the bike path, or waited to pick up their children or friends at Mainland Regional High School across the street — wondered what all the activity was about. “Someone texted and told me about it, but I didn’t believe it,” said Mainland student Deena Capizzo, of Northfield, who said word started to get out just before school let out. Wyocum was referring to what had been the first homicide in memory in Linwood less than three years ago, when Catherine McGowan, 89, was stabbed to death in her former retirement community in October 2009. Her neighbor, Anthony Milano, was sentenced to life for the crime and committed to a psychiatric facility. Mayor Richard DePamphilis III said he was “absolutely shocked” to hear of Kauffman’s murder, but not that something like that could happen in Linwood. But DePamphilis said that until the details of this shooting are known, that he would not know if the city is as prepared as it should be. Butler said the local veterans community, including himself, was in shock at the loss. Dan Danchak, a Vietnam vet and friend who worked alongside Kauffman on the Shore petition drive, said he was planning to share a cigar with her. He said Kauffman, like himself, had had a difficult childhood that she shared with only a few of her friends. Kauffman’s Facebook page was full of sentiments as news spread about her death. The first were concerned postings friends asking her to call, hoping she was OK, before the realization of loss set in. The Atlantic County Prosecutor’s Office Major Crimes Unit and the Linwood Police are currently investigating. Anyone with information is asked to call 609-909-7666 or 609-927-4108. Staff writers Lynda Cohen, Jennifer Bogdan, and Rob Spahr contributed to this report. Photo gallery from the scene of the homicide on Woodstock Drive in Linwood. Very sad heart tonight ... RIP April. No new information is being released on the killing of well-known Linwood radio personality April Kauffman.